Contemporary, modern slab china cabinets and custom china hutches are handmade in Montana and shipped worldwide. Antique glass in upper cabinet doors. Stickley hardware and adjustable glass upper shelving and oak lower shelving. 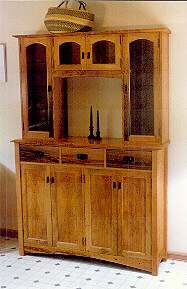 Rustic custom hutch / china cabinet using natural bug holed, quarter sawn, red oak. Natural bug holed, quarter sawn, red oak custom hutch / china cabinet. 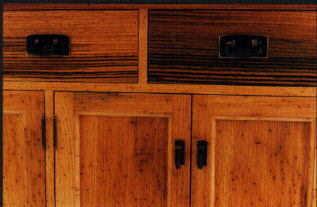 Note the dark coloring in the drawer fronts, this was made naturally from the spalting in the wood as it lay curing in nature. This piece was finished with hand rubbed oil, no stain was used… all natural colors. This special piece looks great in a traditional dining room, or in a rustic setting. Let your imagination be your guide. Size 53″ W X 78 ” H X 16″ D.